Conducting original scientific research is the keystone of everything we plan and hope to accomplish through the ReefQuest Centre for Shark Research. All of our education and conservation projects are deeply rooted in accurate, up-to-date, Science. Despite centuries of calumny and hysteria, the basic life history, behavior, and ecology of most elasmobranch fishes remains virtually unknown. It is vital to the continued survival of these wondrous creatures that biological ignorance of and widespread indifference to sharks and rays are replaced with scientific knowledge and public concern. Toward that goal, the Centre conducts its own series of selected elasmobranch research projects in the laboratory and in the field as well as collaborates openly with other workers throughout the globe. 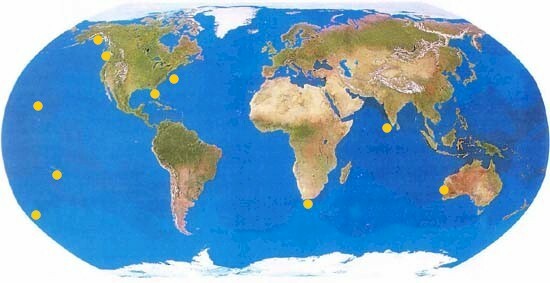 To find out more about a given project, move your cursor over the yellow dot on the above map.